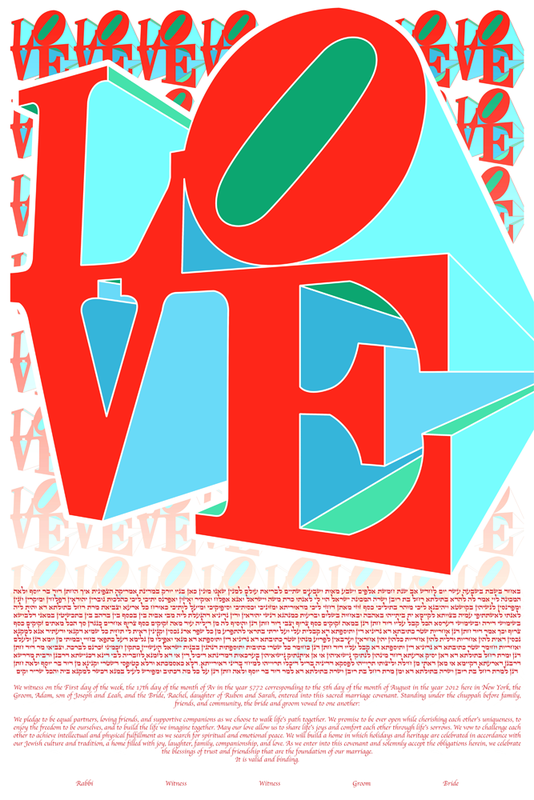 This Ketubah is inspired by the simple, yet stunningly bold works by Robert Indiana, or more specifically, his famous iconic piece — the Love Sculpture in New York City. The Love Ketubah exhibits the classic style of Robert Indiana blended with the romance and significance of a modern Ketubah. The bolder colors fading to an all white background creates emphasis and light around the Ketubah text. The Love Ketubah is perfect for the couple that is looking for something that is retro, yet still contains an element of modern minimalism. This work of art will stand out in any room of the house and add an element of excitement! The colors on this Ketubah really brighten up the design and bring a real central focus to what the Ketubot tradition is all about — your love. Take a look at our other version of this Ketubah!